Fluid contamination is a leading cause of slower performance, erratic operation, lost productivity, higher operating costs and catastrophic failure of mobile construction machines and equipment. Triple R Technology has proven added value for many customers globally active in the construction market working with mobile vehicles and mobile installations. Mobile machinery typically use many oil systems to perform tasks in varied locations. The mobile units are by definition expensive equipment that must work when on site. 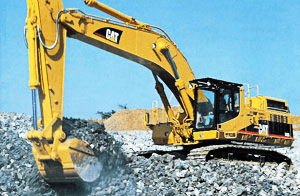 Often, other processes begin only after the mobile machinery has finished its job, so production stops have to be avoided at all expense since stops can delay an entire project. Unaddressed contaminations lead to inefficiencies with fluid, engine oil as well as hydraulic oil. In hydraulic systems productivity losses can be undetected as efficiencies can drop to 20% before the operator even detects a change in operation. That is losing a day in productivity due to efficiencies each week. There was a time where hydraulic pressures were much lower than they are today, that clearances between internal metal to metal surfaces where not as tight and we were concerned about contaminants we could see. But as customers ask for more power, higher breakdown forces and faster cycle times, the machinery industry is responding with more sophisticated fluid system designs, higher pressures, tighter clearances and electro-hydraulics have made mobile machinery more productive and easier to operate. However, they have also increased the need for clean fluid systems throughout the life of the product. Operators and maintenance teams now have to be concerned about dirt and other contaminants they cannot see, particles as small as 2 to 5µ. Those small particles can be the beginning of premature wear and efficiency loss and it does not take too many particles to contaminate a system. A consequence of the outdoor construction application is also that the mobile machinery is prone to water condensation as well as particle contamination in the oil. Triple R Filtration technology can be used with standard filter elements or in case of higher amounts of water with Water Eater Elements (WE) on the mobile equipment to remove particles and condensed water in only one process. It is clear that breakdowns due to contaminated oil results in dramatic effects. Triple R Filtration systems effectively remove condensed water, sludge, water and particles with one and the same filter element. This high level oil purification increases the reliability, uptime and lifetime of expensive components such as motors, proportional and servo valves. Typical effects of oil contamination can be cylinder drift, jerky steering, slower performance, erratic operation, shorter service intervals, higher operating costs, lost productivity and catastrophic failure.